I hung out on the land today trying to catch bad guys. A car did start down the road, but I was focused on photographing a butterfly on the road. I didn't hide in time and they saw me and took off. Here's a picture of the butterfly. I bet it was cooler than the bad guys were anyway. There's a really shy spider on the road by the field. I finally got a picture of it, but when I got home I discovered I got a picture of its underside. I'm pretty sure that it's a Spiny-Bellied Orb Weaver. I haven't seen any others of these, so I'm tempted to catch her and take her onto my property. But she may have already laid her eggs, and if she hasn't and I move her, she may never find Mr. Spiny-Bellied Orb Weaver to make Spiny-Bellied Orb Weaver babies. So I guess I'll leave her where she is and hope that some of the next generation will decide to move on over to my land. There was also a mystery critter in one of the rainbuckets. I think it might be a hellgrammite. 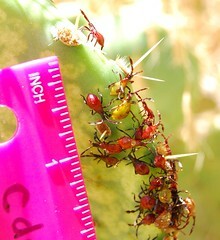 And there were some cool bugs on the prickly pear. I wore my new snake boots for the first time. They were really comfortable and they must be good because I didn't get a single snakebite the whole time I was out there. 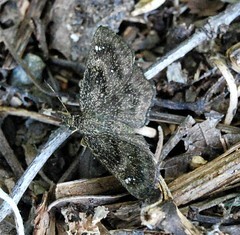 Butterfly: I think it's a Juvenal's Duskywing, but because of the background, and the small size on my screen, I can't be sure. Critter in bucket: Dunno. I know there are Dobsonflies around, so hellgrammites are to be expected. But I don't know what the local ones look like--never seen one. I think it would rather live in the river, but I could be wrong. Bugs on cactus: Nymphs of bugs or beetles, probably bugs. If they were on milkweed, the red ones would definitely be Giant Milkweed Bug nymphs, but there are undoubtedly cactus-eating bugs with nymphs that look similar. Thanks for the compliment and the ID help. I read the spider info, and now I think it might be an Arrow-shaped Micrathena (see http://bugguide.net/node/view/2020). I'll try to get a picture of its topside when I have a chance. Also, while researching the spider I learned that the zig-zag part of a web is called the "stabilimentum." I think that's funny because the name implies that it's a structural part of the web put there to provide stability. 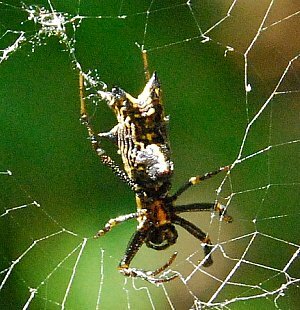 But it seems obvious to me that the spider uses it for camouflage (link is to small picture). In reality, Nature is so economical that the zig-zags probably serve both purposes. I tried to look up the butterfly starting with Juvenal's Duskywing, but there are too many butterflies that look the same to me and my photo isn't that good. I actually have another similar butterfly photo I took last week. But that butterfly seems more brown and it only has two dots on its wings. 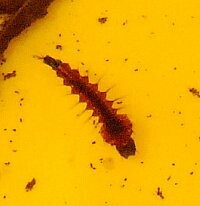 Someday I will sit down and ID all my critter pictures. I didn't realize there were nymphs specific to Giant Milkweeds. Arrgh! Are the orange nymphs I see on thistles Special Thistle Nymphs, or worse yet are there separate Bull Thistle Nymphs and Scotch Thistle Nymphs? Oy vey!!! Just when I think I'm beginning to get a toehold on this ID stuff it turns out to be even more specific than I ever imagined. Just remember, in taxonomy there are lumpers and splitters. Right now we prefer splitters. "oh, it has yellow spots instead of red spots? Must be a new species!" Then you get to name the new species and announce the discovery and put in for endangered species status. Lumpers say "oh, the squirrels here are black not grey! What a cool genetic variant!" But discovering a new variety doesn't make the news, and while it's the same genes in danger of disappearing, there isn't an endangered _variety_ act. And lumpers run the risk of overlooking important distinctions because of apparent similarities. PS these are REALLY REALLY beautiful pictures. I'm waiting for the book. I'll help you work on the book. You need to make a book. C, did you get my email yesterday about the spreadwing? Dr.Abbott thinks it may be an important find. I thought I'd replied to your e-mail, sorry. Dr. Abbott and I are in communication about it. Thanks for the tip. Unfortunately none of my photos have provided conclusive evidence. So I'm going to try and catch one. If I don't succeed, he may come out to my land in a couple of weeks to try to find one.